The TRSS series has been discontinued. Please contact our Temperature Engineering department for a viable replacement. 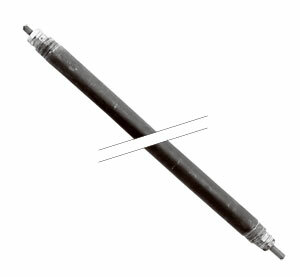 ADVANTAGES The metal sheath isolates and protects the resistor wire from the environment. At the same time it maximizes heat transfer capability to the work. Tubular elements can be bent to put the heat where it works best. FEATURES Type 4 Terminals: Integral parts of the element are of high strength to resist bending during tightening of the wiring connections. Type 4 is threaded extension of the cold pin. See terminal detail drawing in the Tubular Heater Overview section. Work Temperatures: See Tubular Heater Overview section. Bending: Customer’s minimum inside bending radius is 1½". See bending requirements in the Tubular Heater Overview section.